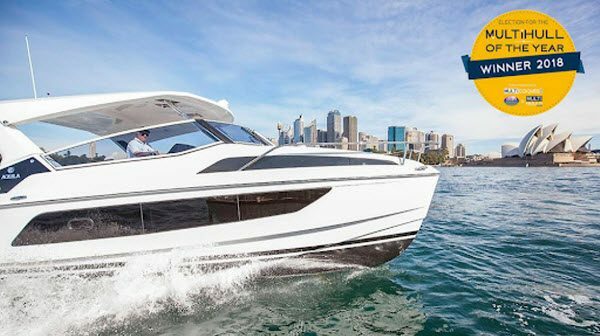 The luxurious Aquila 36 power catamaran was only launched last year, but already it’s made its presence felt in the market, winning not one, but two international awards. In addition to being named “The Multihull of the Year” (Power Multihulls category) by Multihulls World magazine, the Aquila also won the “Best Multi-Hull Motor Yacht Under 15m” category at the prestigious Christofle Yacht Style Awards, which are designed to showcase innovation, excellence and creative flair in the latest motor and sailing yacht models presented in the Asia-Pacific region. …and why is this exciting new power catamaran like no other in its class? …the Aquila 36 is whatever you want it to be. The seating in the spacious bow entertaining area can be configured in three different ways. You can sit back and enjoy a glass of something cold and bubbly in the forward cockpit seating area, quickly convert it to wide lounges for relaxing in the sun with a book or fold the seats totally flat to make double sunbeds. The Aquila’s spacious entertainer’s deck offers you so many different options to comfortably accommodate up to 20 of your friends, family or colleagues. And the Aquila is more than just a dayboat. With two double berths and an ensuite Corian bathroom in each hull, you can also enjoy luxurious overnight stays with plenty of onboard storage. Want to relax even more? Fold the seats totally flat to make two double sunbeds when it’s time for a little nap and you can also make another double sunbed from the aft seating. When it’s time for a quick dip, the large swim deck and hydraulic swim ladder with grab rail makes it easy to enter the water and climb back on board. The central cockpit has an expansive hardtop with sunroof, day galley and gas BBQ, so easy al fresco entertaining is within arm’s reach at all times. The wrap around windscreen is larger than most 55-foot yachts due to the expansive on-deck salon with a wonderful summer kitchen. The Aquila’s spacious and versatile deck area is larger than most 55-foot yachts, giving you plenty of room to move around without the lean or roll of a monohull! 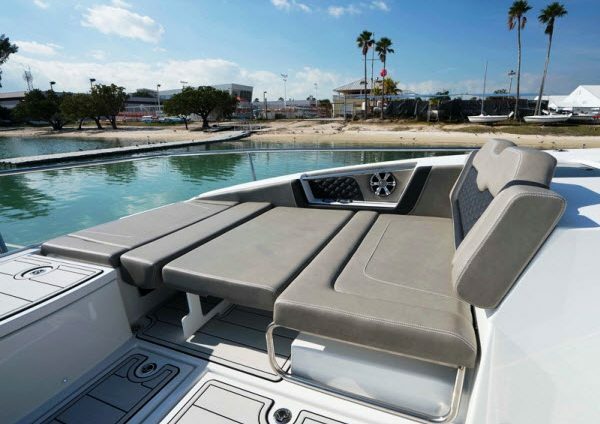 The incredibly smooth and quiet Mercury Verado motors well and attains speeds of over 30 knots. The very high bridge deck clearance assures a smooth ride. There’s no getting away from it. The stunningly unique Aquila 36-foot power catamaran will make you the envy of your friends – and everyone else on the water, for that matter! If you’re prepared to stand out from the crowd and turn heads wherever you go, the AQUILA 36 power cat will change the way you think about enhancing your leisure time. Located at the recently refurbished Clontarf Marina, on your beautiful new Aquila 36 you can enjoy summertime to the max. 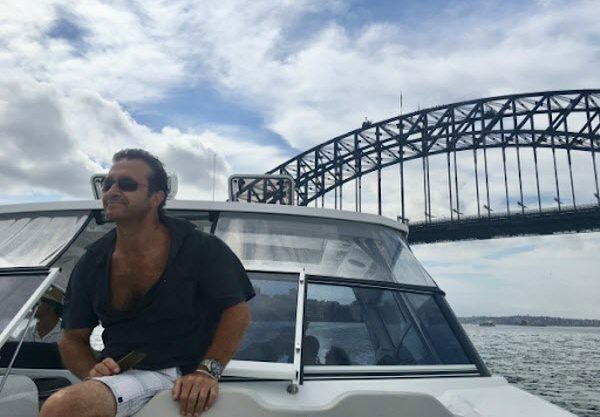 Explore the best views of Sydney from the water, entertain family and friends and soak up the atmosphere of the iconic events that Sydney Harbour is famous for – The Sydney to Hobart Race start, New Year’s Eve fireworks and the Australia Day celebrations, to name just a few. SMART Boating have just 3 shares left in the Aquila 36 yacht syndicate … so don’t miss out! 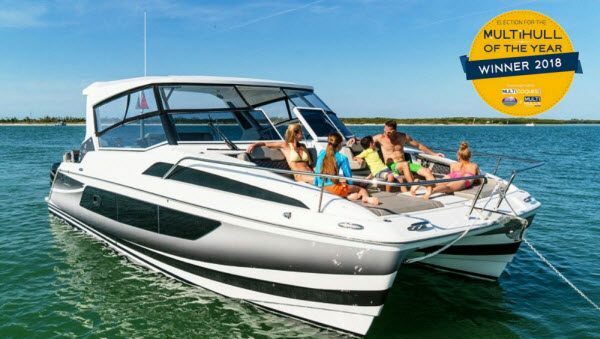 For just $69,500 (with a monthly fee of $673 + fuel) SMART Boating Shared Ownership lets you enjoy 34 days boating per year, unlimited standby days and comprehensive walk on/walk off professional management service.